Current Status: merged into Converse Lodge, 09/23/2009. Canaan Lodge merged here, 06/28/1973. We drew a circle that took him in!" Throughout the ages, man's admiration for his fellow man has inspired him to noteworthy activity and accomplishment. This truism was the motivating spirit in the formation of Mount Scopus Lodge. It was with Worshipful Bertram E. Green that the thought was first conceived. Having long since gained the esteem and admiration of all who knew him for his many unselfish deeds, it was with endless zeal that he encouraged and cultivated the seed that found root in his mind. He very quickly enlisted the aid of Brother George Kramer, and together they set out to exert all their energies to nurture into being this institution which was to be known as Mount Scopus Lodge. In the Fall of 1929, Worshipful Phillip Wheeler, Master of Converse Lodge, arranged an interview between Brother Bertram E. Green and District Deputy Grand Master Charles M. Proctor, who displayed a profound interest in the movement and offered his fullest cooperation. He brought the matter before Most Worshipful Herbert W. Dean, Grand Master, where he found an attentive ear. It became necessary to interview approximately seventy-five prominent Masons and to acquaint them with the project. This part of the task brought to our Founders and later to Mount Scopus Lodge innumerable friends. Among these, Worshipfuls George M. Keen, Phillip L. Wheeler, John F. Neal, Louis P. Sanborn, Right Worshipful Charles M. Proctor, and Brothers James Armstrong, Fred Prescott, and Louis Dexter became deeply involved in the work of organization and lent their sincerest support to this undertaking. Chief among those who so ardently urged and aided the development of this new Lodge was our very esteemed and beloved Brother, Right Worshipful Frederic L. Putnam. From his very first knowledge of the work at hand, Brother Putnam worked assiduously with our Founders to make this dream a certainty. Mount Scopus Lodge will always be indebted also to these brethren: Worshipful Arthur W. Coombs, A. L. Glossa, Wilbert C. Hodgdon, Brother Cyrus F. Springall for their interest and their active participation in the formative period of our organization. For the late Worshipful Elliott W. Aldrich, our First Senior Warden, we will always have the most pleasant memories of our early association. With the enlisted aid of the above brethren, very rapid progress was made. Three petitions were drawn and presented to the three Masonic Lodges in Malden for their approval. Each of these Lodges appointed a committee to jointly confer on the necessity and practicability of another Lodge in Malden. When they reported in the affirmative, this joint committee was further appointed to investigate the conditions of organization and lend their fullest support in any needed capacity. The chairman of this committee was Worshipful John F. Neal. His counsel was of inestimable value in those hectic days. In November, 1929, a meeting was held at the ofice of Brothers Cibel and Golden at which a large group of prospective Charter members was present. The guest speaker of the evening was Worshipful Hugh E. Allen, first Master of United Lodge. His subject was "How to Organize a Lodge." His interesting discourse suggested much profitable information which was used in the following days to great advantage. The business of the evening was carried on with a cheerful enthusiasm which became a marked virtue of our Lodge as the years rolled on. Much had been accomplished that evening. Brothers Bertram E. Green and William R. Gilman reported that a sincere welcome awaited our arrival on the Masonic horizon and that the Charter membership list was being increased. There was a discussion regarding the name for this child. It is significant that the name should have been suggested by Brother George Kramer, an individual who has devoted his life to the interest of his people. Now that a Lodge was to be formed by Brethren chiefly of his faith, his mind naturally turned to Palestine and there found a name symbolic of the activity of our people, a name which connoted culture and education, two outstanding tenets of Freemasonry. To Brother Kramer are we indebted for the name which was finally accepted by the Grand Lodge- Mount Scopus. At the next conference, the all-important subject as to who would be first officers of the new Lodge was discussed, and to the utmost satisfaction of all the brethren, Worshipful Richard Hardwick, Past Master of Converse Lodge, was chosen as the First Master; Worshipful Elliott W. Aldrich, Past Master of the Lodge of Stirling, was chosen as the First Senior Warden; and Brother Elbridge G. Davis, 33rd degree, was chosen as the first Junior Warden. The remaining officers were to be selected from the Charter Membership. A formal petition was presented to the Grand Master on January 3, 1930, signed by fifty-eight Brethren. Right Worshipful Charles M. Proctor gave generously of his time and effort in the culmination of this work, and justly earned the sincere thanks of all the Brethren. With permission to proceed with organizadron, Worshipful Richard Hardwick assumed Ieadership and started a series of interviews with regard to filling the various offices. Several organization[al] meetings followed. With plans for the red letter day completed, the date for Institution of Mount Scopus Lodge was designated as February 25, 1930. The records of that date read that a "Disrict Deputy Grand Lodge was opened at 8.00 p.m. by Right Worshipful Julian C. Woodman, District Deputy Grand Master of the Malden Seventh Masonic District." Following the installation Brother William R. Gilman proposed Israel I. Kotzen, and on June 2, he was the first candidate to be raised to the degree of Master Mason. During the period of Dispensation, sixteen communications were held and twenty Brethren were raised to the degree of Master Mason. The period of Dispensation having elapsed, plans were formulated for Constitution. The date was designated as January 5, 1931. Three hundred and eight Brethren were present to witness this unusual service of Constituting a new Lodge. The ceremonies under the direction of Most Worshipful Herbert W. Dean were most impressive. Concluding the Constitution, at which time the Charter was read and presented, the Grand Master installed Worshipful Richard Hardwick as the first Master of Mount Scopus Lodge. The other elected officers were installed by the corresponding Grand Lodge officers, and the appointed officers were installed by the Deputy Grand Master. Most Worshipful Herbert W. Dean then addressed the brethren on "The Many Responsibilities of a New Lodge." During the first administration, Honorary Membership was conferred upon Right Worshipful Charles M. Proctor. Worshipful Elliott W. Aldrich and Rev. Brother Roy L. Minich were proposed for Honorary Membership by the Master and were elected at the opening of the second administration. Brothers Edward I. Golden and Isidor H. Friedman found it necessary to resign from office and Brother Jacob J. Glazin was appointed Junior Steward and Brother Jacob I. Ziner was appointed Inside Sentinel. As an innovation, Brother Israel Titelboum presented Donation Number One to the Relief Fund. This was an admirable deed and has established a precedent that has been emulated by every candidate admitted to Mount Scopus Lodge. On Septembet 23, 1931, Worshipful Richard Hardwick concluded his term of office, having justly earned the esteem of all the Brethren who were privileged to know him. The succeeding years were rich in friendship and activity. The many innovations inaugurated by each Master, and the merited recognition for Masonic service of the various members have given Mount Scopus Lodge an enviable niche in Masonic history. Our second Master, Right Worshipful Elbridge G. Davis, who served in the East in 1932 and 1933, was appointed District Deputy Grand Master for the Malden Seventh Masonic District by Most Worshipful Claude L. Allen in December 1935. He held this office for two years. The officers and members rejoiced with Brother Davis at this appointment. Worshipful William R. Gilman, third Master, presided over the Lodge in 1934 and 1935. Because of his continued interest in Masonry, he was elected Master of the 35th Lodge of Instruction for 1937. Since that time he has served as Lecturer for that body for several years. Another member who has received acclaim for his Masonic endeavors, is Brother Raphael P. Boruchoff. It was he who created what was known as a fourth class. His Lectures attracted the attention of the Grand Lodge and his syllabus was used in various Lodges of Instruction throughout the State. On September 25, 1935, Worshipful Betram E. Green became the fourth Master. Having given so much of himself in the creation of this organization he was thus honored for a stupendous task well done. Worshipful Brother Green is now Treasurer of the Lodge and maintains an ardent interest in the Lodge of Instruction, serving as one of the Lecturers. It was during this, his administration, that the Membership dinner and the Annual Children's Party were inaugurated. Since the inception of the Lodge, the manifestation of interest and loyalty of the members has been a strong factor in the growth of our organization. The many gifts which have been presented by the Brethren in other Lodges will be recorded in the printed History which will be ready at a later date. During these years the standard of the officers' work has always been the cause of most complimentary comment. The officers have endeavored to maintain a high percentage of attendance at Visitations and Exemplifications. During the Fifth Administration of 1938 and 1939, a method of interesting members in the work of the Lodge was employed by inviting Brethren who held no office to participate in the degree work. Another innovation of this administration seldom seen in a Masonic Lodge was the Annual Pop Concert. A feature of this event was that the presiding Master conducted a group of Symphony Players. This administration with Worshipful Edward I. Adelman, Master, marked the close of an era in the life of Mount Scopus Lodge. Brother Adelman was the last of the Charter members to sit in the East. The first decade is behind us. With Worshipful Jacob J. Glazin we look forward to the beginning of the second decade. This scintillating individual is the first of the members who were raised in Mount Scopus Lodge to sit in the East. The first significant act of his administration was to confer Honorary Membership upon Right Worshipful Frederic L. Putnam. As we celebrate the tenth anniversary with our capable Master, we trust that Mount Scopus Lodge will endure the vicissitudes of time and be a means of cementing a strong band of friendship between men. May our successors receive the blessings of the Almighty in all their endeavors, for in the words of the poet, "Each age is a dream that is dying or one that is coming to birth." By Worshipful Edward I. Adelman. By Harmony the World is made." Throughout the ages, man's admiration for his fellow man has inspired him to noteworthy activity and accomplishment. This truism was the motivating spirit in the formation of Mount Scopus Lodge. It was by Worshipful Bertram E. Green that the thought was first conceived, and no history of our Lodge would be full in thought and retrospection without tribute to Brother Green, who is now serving his sixteenth year as our Treasurer. His wisdom and sincerity played a tremendous part in the fulfillment of his dream for "he built better than he knew." It was with endless zeal and tenacity that he encouraged and cultivated the seed that found root in his mind. He very quickly enlisted the aid of Brother George Kramer, and together they set out to exert all their energies to nurture into being this institution which was to be known as Mount Scopus Lodge. The first step was taken in the Fall of 1929 when Worshipful Philip L. Wheeler, Master of Converse Lodge, arranged an interview between Brother Bertram E. Green and District Deputy Grand Master Charles M. Proctor, who manifested a profound interest in the movement and offered his fullest cooperation. He brought the matter before Most Worshipful Herbert W. Dean, Grand Master, where he found an attentive ear. It became necessary to interview approximately seventy-five prominent Masons and to acquaint them with the project This part of the work brought to our Founders and later to Mount Scopus Lodge innumerable friends. Among these, Worshipful Brothers George M. Keen, Philip L. Wheeler, John F. Neal, and Lewis P. Sanborn, Right Worshipful Charles M. Proctor, and Brothers James Armstrong, Fred Prescott and Louis E. Dexter became deeply involved in the work of organization and lent their sincerest support to this undertaking. Chiefly among those who so ardently urged and aided the development of this new Lodge was our esteemed and beloved Brother, Right Worshipful Frederic L. Putnam. From his very first knowledge of the work at hand, Brother Putnam worked assiduously with our Founders to make this dream a certainty. Mount Scopus Lodge will always be indebted to Worshipful Brothers Arthur W. Coombs and A. J. Glossa and Brothers Wilbert C. Hodgdon and Cyrus F. Springall for their interest and their activity in the formative period of our organization. For the late Worshipful Elliott W. Aldrich, our first Senior Warden, we will always have the most pleasant memories of our early association. With the enlisted aid of the above Brethren, very rapid progress was made. Three petitions were drawn and a copy presented to each of the three Maiden Masonic Lodges for their approval. Each Lodge appointed a committee to confer jointly on the necessity and practicability of another Masonic Lodge in Maiden. When this committee, with Worshipful John F. Neal as Chairman, reported in the affirmative, they were further instructed to investigate the conditions of organization and lend their fullest support in any needed capacity. The counsel of Worshipful John F. Neal was of inestimable value in those hectic days. In November, 1929, a meeting was held at the office of Brothers Cibel and Golden, at which a large group of prospective Charter Members was present. The guest speaker of the evening was Worshipful Hugh E. Allen, first Master of United Lodge. His subject was "How to Organize a Lodge." His interesting discourse suggested much profitable information which was used to good advantage in the following days. The business of the evening was carried on with a cheerful enthusiasm which became a marked virtue of our Lodge as the years rolled on. Brothers Bertram E. Green and William R. Gilman reported that a sincere welcome awaited our arrival on the Masonic horizon and that the Charter Membership list was being increased. There was considerable discussion regarding the name for this child. It is significant that the name should have been suggested by Brother George Kramer, who was strongly supported in this thought by Brother Edward I. Golden, two individuals who have devoted their lives to the interests of their people. Now that a Lodge was to be formed by Brethren chiefly of their faith, their minds naturally turned to Palestine and there found a name symbolic of the activity of our people, a name which connotes culture and education, two of the outstanding features of Freemasonry. To Brothers Kramer and Golden are we indebted for the name which was finally accepted by Grand Lodge, Mount Scopus. At the next conference, the all-important subject as to who would be the first officers of the new Lodge was discussed, and to the utmost satisfaction of all the Brethren, Worshipful Richard Hardwick, Past Master of Converse Lodge, was chosen to be the first Master; Worshipful Elliott W. Aldrich, Past Master of the Lodge of Stirling, was chosen as first Senior Warden; and Brother Elbridge G. Davis as first Junior Warden. The remaining officers were to be selected from the Charter Membership. With permission to proceed with the organization, Worshipful Richard Hardwick assumed leadership and started a series of interviews with regard to filling the various offices. Several organization meetings followed. 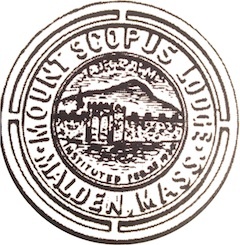 With plans for the red letter day completed, the date for the Institution of Mount Scopus Lodge was designated as February 25, 1930. The records of that date read that a "District Deputy Grand Lodge was opened at 8:00 p.m. by Right Worshipful Julian C. Woodman, District Deputy Grand Master of the Malden Seventh Masonic District." Following the Installation, Brother William R. Gilman proposed Israel I. Kotzen, and on June 2, he was the first candidate to be raised to the Degree of Master Mason in Mount Scopus Lodge. During the period of Dispensation, sixteen communications were held and twenty Brethren were raised to the Degree of Master Mason. On April 23, 1930, Bro. Moses S. Jacobson resigned from office and Bro. Edward I. Adelman was appointed Inside Sentinel. The period of Dispensation having elapsed, plans were formulated for Constitution. The date designated was January 5, 1931. Three hundred and eight Brethren were present to witness this unusual service of Constituting a new Lodge. The ceremonies, under the direction of Most Worshipful Herbert W. Dean, were most impressive. During the first administration, Honorary Membership was conferred upon R.W. Charles M. Proctor. Wor. Elliott W. Aldrich and Rev. Bro. Roy L. Minich were proposed for Honorary Membership by the Master and were elected at the opening of the second administration. Brothers Edward I. Golden and Isidor H. Friedman found it necessary to resign from office, and Brother Jacob J. Glazin was appointed Junior Steward and Brother Jacob I. Ziner was appointed Inside Sentinel. As an innovation, our late Brother Israel Titelbaum presented donation No. 1 to the Relief Fund. This was an admirable act and established a precedent that has been emulated by every candidate admitted to Mount Scopus since that time. On September 23, 1931, Wor. Richard Hardwick concluded his term of office, having justly earned the esteem of all the Brethren who were privileged to work with him and know him. The succeeding years were abounding in friendship and activity. The many innovations inaugurated by each Master, and the merited recognition for Masonic service of the various members have earned for Mount Scopus Lodge an enviable niche in Masonic history. R. W. Elbridge G. Davis, our second Master, who served in the East in 1932 and 1933, was appointed District Deputy Grand Master for the Seventh Malden Masonic District by Most Worshipful Claude L. Allen in December 1935. He held that office for two years. R. W. William R. Gilman, our third Master, who served in the East in 1934 and 1935, was elected Master of the Thirty-fifth Lodge of Instruction in 1937. He continued his interest in Masonry by serving as Lecturer for the Lodge of Instruction for many years. He was appointed Senior Grand Deacon of the Grand Lodge by M. W. Albert A. Schaefer in 1941 and was honored by being appointed Representative of the Grand Lodge of Tamaulipas, Mexico, in 1946. He was further recognized by Most Worshipful Samuel W. Wragg, who appointed him District Deputy Grand Master for the Maiden Seventh Masonic District in 1947 and 1948. On September 25, 1935, Wor. Bertram E. Green was installed the fourth Master of Mount Scopus Lodge. Having given so much of himself in the creation of this organization, he was thus honored for a stupendous task well done. For many years Brother Green maintained an ardent interest in the Lodge of Instruction and served as Lecturer on the Master Mason Degree. Upon resignation of Wor. Walter E. Milliken as Treasurer, Wor. Brother Green was elected to that office, which he still holds. It was during his administration that the Membership Dinners and the Annual Children's party were inaugurated, two functions that continued for some time. During the administration of Wor. Edward I. Adelman, fifth Master of Mount Scopus Lodge, a means of creating greater interest among the members in the work of the Lodge was employed by inviting Brethren who held no office to assume the stations and participate in the degree work. Another innovation of this administration seldom seen in a Masonic Lodge was the Annual Pop Concert, a function that was carried on by each succeeding Master for more than ten years. A feature of this event was that the presiding Master, Brother Adelman, conducted a group of Symphony Players in a program of light classics. This administration marked the close of an era in the life of our Lodge. Brother Adelman was the last of the Charter Members to sit in the East. At the conclusion of his term of office, he was appointed a Lecturer of the Thirty-fifth Lodge of Instruction, and in 1943, became its Master. He was honored by Most Worshipful Roger Keith in 1949 by being appointed Junior Grand Steward and later became a member of the Committee on Education of the Grand Lodge. He has been re-appointed to this office by each succeeding Grand Master. He also served as Historian of Mount Scopus Lodge at the tenth and twentieth anniversary observances. The first ten years of Mount Scopus Lodge may be termed the period of innovation. It was during this period that the ideals and policies of the Lodge were established. The excellence of our work and the high standards by which we are acclaimed are without doubt due in no small measure to the meticulous and disciplinary government of our first Master, Wor. Richard Hardwick. The following years were rich in maturity, with its joys and sorrows: joys in the men who had been chosen to sit in the East of Mount Scopus Lodge and in our many accomplishments; sorrows that in advancing age we too have suffered the vicissitudes of time — the passing of earlier associates, prolonged illnesses, and the depression of a world war. At the close of the first decade, Wor. Jacob J. Glazin, a scintillating individual, was installed the sixth Master of Mount Scopus Lodge. His innate capacity to make friends and his continual solicitations in behalf of the membership strengthened the happy relationship that was fast becoming a marked attribute of our Lodge. It was during this administration that R. W. Frederic L. Putnam was elected an Honorary Member of the Lodge. Brother Glazin conducted the observance of our tenth anniversary which was a happy finale to ten years of activity. This observance included Divine Service at Temple Tifereth Israel, the Lodge observance which was attended by Most Worshipful Joseph Earl Perry and a large suite of Grand Lodge Officers, and finally the brilliant tenth anniversary Ladies' Night at the Hotel Statler. The history of this period was published and distributed among the members. Wor. Brother Glazin has continued his close interest in the Lodge and is now Chairman of the important membership committee. He served as Master of the Thirty-fifth Lodge of Instruction in 1953. At the conclusion of the administration of Wor. Jacob J. Glazin, who was the first of those raised in Mount Scopus Lodge to serve as its Master, the world was engulfed in the mad holocaust of World War II. It fell to our seventh Master, Wor. Jacob I. Ziner, to assume office during these trying years. However, with his quiet manner, he carried our Lodge along on an even keel and found the ingenuity to promote a program replete with precedent and innovation. The superior and active Service Committee was organized in this administration under the leadership of Bro. Leonard K. Millen, who served as its Chairman for seven consecutive years. The Ten-year Medals which we carry in our pockets are the innovation of Brother Ziner. It was during his term of office that the four Maiden Lodges met in joint communication to honor our late Brother Edward H. Small upon his completion of twenty-five years of service as Tyler of the Maiden Lodges. This special communication was held by invitation of Mount Vernon Lodge, the mother Lodge of Brother Small. An interesting note in our records shows that during the meeting of September 23, 1942, an air raid alarm was sounded and many Brethren, including some of the officers, left the lodge-room to respond "to their respective stations in the Civilian Defense Organization for which they had volunteered." During the following war years, the demands upon the officers to confer degrees upon candidates who were called into service were many. Very often degrees were conferred upon service men during their furloughs. The Grand Lodge must have felt the burden of the many dispensations. The officers of Mount Scopus Lodge carried out their assignments with cheerfulness and true patriotic spirit. We were fortunate to have as our Master during this period Wor. George K. Gordon, whose love for his fellow being gave him the sagacity and the strength to meet the requirements with a cheerful willingness, and he received the gratitude of all who were beneficiaries of his service. His entire administration was filled with activity of friendliness and brotherly love. The record of his two years as Master of Mount Scopus Lodge shows his constant desire to bring about a closer relationship among men. His administration was particularly outstanding for the many special nights: Boston English High School Class 1913 Night, Chelsea Night, Brother William Gilman Night, R. W. Charles M. Proctor Night, Fifteenth Anniversary Night, his many interfraternal visitations with our sister Lodges. He was the first Master to receive and raise his son in the Lodge. It was during his term of office that we witnessed the raising of sons of Past Masters for the first time, in the raising of Brothers Allan I. Glazin and Erwin N. Ziner. The officers and members of Mount Scopus Lodge, as well as all the Fraternity, were shocked to hear of the sudden death of Wor. George K. Gordon on March 3, 1948. He left a glorious record of achievement, and the memory of his amiable personality will always remain with those who knew and worked with him. As Wor. Robert J. Nathan assumed the East, the turbulance of the world was subsiding, and thoughts were turned toward stabilizing conditious. It was a period of transition that engulfed this administration. The sympathetic understanding of the problems by Wor. Brother Nathan kept the work of the Lodge going smoothly and with harmony. His careful planning of the special occasions culminated in one of the more memorable events in our history, the Military Night of March 26, 1947. The class raised that evening were all returned service men, and the last man was raised by a group of officers "arrayed in full military uniform with the insignia of their rank during the World War. The work was done with military precision and true Masonic enthusiasm." During World War II, forty-two members of our Lodge served in the various branches of the Armed Forces. As a memento of the Military Night, their names were recorded in a very attractive booklet compiled by Bro. Leonard K. Millen, who is also the creator and editor of our popular Mount Scopuscopes. This administration was further highlighted by the appointment of R. W. William R. Gilman as District Deputy Grand Master of the Maiden Seventh Masonic District. He appointed two Past Masters of Mount Scopus Lodge to serve with him: Wor. Jacob J. Glazin, District Deputy Grand Marshal, and Wor. Edward I. Adelman, District Deputy Grand Secretary. This was the first time that a suite was composed of Past Masters of Mount Scopus Lodge. The first visitation of the new District Deputy Grand Master was made on January 22, 1947, and the reception planned by Wor. Brother Nathan proved to be a definite milestone in the life of our Lodge. Wor. Brother Nathan had the good fortune to preside in the East of Mount Scopus Lodge when Mount Sinai Lodge of Lynn was granted a dispensation. Masonic relationship was at once established, since many Charter Members of Mount Sinai Lodge are also members of our Lodge, and one of our members, Wor. Nathan Ogan, was to become the fourth Master of Mount Sinai. The two Masters conferred, and Brother Nathan and his officers went to Lynn to exemplify the Entered Apprentice Degree. On November 11, 1951, we were saddened by the news of the passing of Wor. Robert J. Nathan, following a long and suffering illness. He was our ninth Master, and through his zeal for and interest in Masonry, he had one of the most active administrations of our Lodge. His sincerity and friendliness made a lasting imprint upon the hearts of all who knew him. Mount Scopus Lodge was to enter upon a new era of accomplishment. What might be called the second generation took over the supervision of the Lodge on September 30, 1947, when Wor. Benjamin Ruderman was installed Master. He was the first to enter the East who was appointed by a Past Master. With a new generation came new ties and new thoughts based upon a firm foundation. Prominent in this administration was the Brotherhood Night which was sponsored by Mount Scopus Lodge on February 25, 1948. The Masters of the four Maiden Lodges joined in the degree work of the evening, which was followed by an address on "Brotherhood" by our own Chaplain, Rev. Bro. Roy L. Minich, D.D. Once again the friendship and good fellowship of the four Lodges was promised to be one of the most enjoyed activities, The Family Outing. An outgrowth of the second generation was the Family Night which was promoted by Brother Ruderman. The members of the Lodge who were fathers of members were guests of the Lodge on this occasion, and they were tendered the filial esteem which was theirs. That same evening, WTor. F.dward I. Adelman was warmly recognized in observance of his Grand Lodge appointments. He had been appointed a member of the Grand Lodge Committee on Education as Zone Committeeman for the Thirty-fifth Lodge of Instruction and Junior Grand Steward for the year 1949. Wor. Myer Baker, our eleventh Master, always effervescent in his friendship, relived the traditions of our Lodge in his persistent endeavors to promote the ideals of Freemasonry. An unusual meeting of the four Maiden Lodges was held during his administration in observance of Brotherhood Week. The officers of these Lodges intermingled in each other's line during the work of the first degree as though losing their identity and serving Masonry. The guest speaker of this meeting, Wor. and Rev. John Nicol Mark, with his wit and his philosophy, was a fitting addition to such a program. A similar meeting was held the following year with Wor. Edward J. Hoffman taking an active part. On June 27, 1951, Brother Hoffman set aside the evening to honor the Service Committee of Mount Scopus Lodge in observance of the tenth anniversary of their organization. This Committee has become an integral part of our program through their constant efforts in behalf of the many activities of our Lodge. They are especially active in promoting the very much needed Blood Program. Under the leadership of Wor. I. Conrad Berman, Mount Scopus Lodge entered upon a new project. Through the voluntary contributions of the membership, $3,000.00 was raised and presented to Brandeis University to establish a fund to be known as the Mount Scopus Lodge-George K. Gordon Scholarship Fund. The presentation was made on December 26, 1951, to Dr. Ludwig Lewisohn, who acted in behalf of the University. Each year some young student benefits from the income of this fund. The first concentrated drive for blood donations to the Masonic Blood Bank was made during the administration of Wor. Herman Green. The success of this first drive gave impetus to all succeeding efforts in behalf of this project, which has become one of the most active endeavors of the Lodge. The Brethren are most responsive to the call when it comes, and we are proud to number several Gallon Donors among our membership. The integrity and dignity of Wor. Herman Green manifested itself in his every act. His program during the year gave us the opportunity to hear some of the most noted speakers in the field of education, government, international affairs and sports. Among these were Dr. Harold C. Case, President of Boston University, Dr. Pierre Van Paassen, internationally known author and lecturer, and others. Ever cognizant of the needs of the less fortunate, Wor. Charles I. Seigal, our fifteenth Master, inaugurated the Philanthropic Fund, which would serve those who could not come within the scope of our Relief Fund. The monies for this fund were raised by voluntary contributions of the members and under the Chairmanship of Wor. Herman Green, the Committee brought good cheer and relief to many worthy recipients. The generosity of our members is constantly manifested in their unsolicited contributions to the Happy Day Fund. This fund allows the Master an opportunity to further extend the hand of friendship to the Brethren in times of gladness or sadness. After serving our Lodge as its Organist for twenty-five years, Wor. R. Franz Reissmann found it necessary to retire because of impaired health. Llis resignation was accepted with deep regret, and on September 22, 1954, the Master, Wor. Charles I. Seigal, delegated our first Master, Wor. Richard Hardwick, to present Brother Reissmann a properly inscribed plaque in token of the friendship and esteem of the Lodge. We have lived through our first quarter century, and we are proud of our accomplishments. Since the inception of the Lodge, the manifestation of interest and loyalty of the members has been a strong factor in the growth of our organization. The standard of the officers' work has always evoked most complimentary comment. The officers have endeavored to maintain a high percentage of attendance at visitations and exemplifications. Our membership as of this date numbers 624. Of these we have members living in eleven states of these United States and one in Canada. During the twenty-five years of the life of Mount Scopus Lodge, fifty-one Brethren have been called to the Celestial Lodge above. We are now entering upon a new era under the leadership of Wor. Leonard K. Millen, who through the years made a lasting contribution to the growth of the Lodge. One of his first acts as Master was to stream-line our Lodge notice, which evoked considerable favorable comment from the membership. His solicitations for the welfare of the Brethren and his interest in Mount Scopus Lodge bespeaks for us continued glorious adventures in the realm of Freemasonry. In recalling the joys of our Institution, we bow reverently in memory of those who have had a share in the growth of our Lodge, and with the help of our Creator, we look forward to many years of spiritual achievement in our contribution to our Brethren, our community and Masonry. "Let us thank the lavish hand that gives worldly beauty to our eyes And bless the days that saw us young and years that made us wise." (For the history of Mount Scopus Lodge for the period from 1930 to 1955, refer to 1955 Mass. 90-103). We entered the second quarter century under the leadership of the amiable, articulate Worshipful William Gilman, the seventeenth Master of Mount Scopus Lodge. Symbolic of his philosophy of Freemasonry was the continuation of the meeting of the four Maiden Lodges during Brotherhood week as the officers intermingled in the ritual of the first degree, entering a candidate from each Lodge. Another innovation in our history was the first Clergy Night with ministers and rabbis assuming roles as line officers to raise a candidate to the sublime degree of Master Mason. An emotional first occurred on September 26, 1956, when Worshipful Jacob J. Glazin installed his son, Worshipful Allan I. Glazin as Master. The relationship of various officers to Past Masters accentuated the happy atmosphere of the evening. One of the highlights of the year was the first Table Lodge ceremony at Mount Scopus Lodge. Another memorable meeting featured members of our Lodge who were Past Grands of the Odd Fellows in raising a brother in due and ancient form. In March, 1957, an outstanding communication took place in the new Masonic Apartments in Melrose - a change due to lack of space - when officers of the Manchester Lodge No. 73 of Connecticut presented the drama of the "Widow's Son" before an overflow audience of enthusiastic, appreciative brethren. Worshipful Morris Baker assumed the Oriental Chair as the nineteenth Master. This eloquent individual, with a flair for the dramatic, made each meeting and dinner program an enjoyable event. His inspiring leadership challenged the line officers to perform a quality of ritual whose excellence evoked a spontaneous storm of applause at the conclusion of their work. The March communication provided the highlight of his administration as the colorful Ebb and Flow Club from the Naval Air Station at South Weymouth presented their unique ritual of the third degree to the applause of a capacity audience in the Lodge room. Worshipful Martin Weiner continued the traditional programs of the Lodge. One of the most enthusiastic meetings honored the dedicated members of the Service Committee for their exceptional help during the year. A large gathering in March witnessed an interesting "Drama of the Third Degree" by the Dean K. Webster Memorial Degree Team according to the Florida ritual. However, the outstanding event of this administration was the Past Masters' Night which featured a Fraternal Visit by Right Worshipful Jacob J. Glazin, District Deputy Grand Master of the Maiden Seventh Masonic District, accompanied by Worshipful Myer Baker, District Deputy Grand Marshal and Worshipful J. Conrad Berman, District Deputy Grand Secretary. This was the second time in our history that this suite was composed of Past Masters of Mount Scopus Lodge. as he attended the first Official Visitation to Mount Scopus Lodge, made by Right Worshipful Jacob J. Glazin. The December meeting witnessed an unexpected ceremony as a brother of the Lodge of Saint Mark of Halifax, Nova Scotia, received his Fifty Year Medal. The evening of February 24, 1960, was dedicated to the Charter Members of Mount Scopus Lodge in observance of our Thirtieth Anniversary. The Deputy Grand Master, Right Worshipful Carl C. Peterson, brought official greetings from the Grand Lodge on this occasion and spoke on the need of greater understanding. The many occurrences of family relationships among those assuming leadership roles in the Lodge had a strong emotional impact which increased the warmth and fellowship apparent at the meetings and social activities for so many years. The administration of Worshipful Daniel Seigal illustrated this happy motif. A Ruderman Family Night was an opportunity for the members of that family to occupy the stations in the ritual of the third degree. At the Brotherhood Night, the presiding Masters of the Maiden Seventh District participated in the work of the evening. On March 21, 1961, the Master introduced another first in our history at a Bench and Bar Night featuring members of that profession as line officers. One of the most impressive ceremonies of the year was the solemn service in memory of Brother Israel W. Gould at which time the Gould family presented a Marshal's chair to Mount Scopus Lodge to commemorate his years of service to the Lodge in that capacity. The twenty-third Master of the Lodge was installed on September 27, 1961, as Worshipful Joseph Grossman assumed the Oriental Chair where he continued to exhibit the qualities of leadership which he had demonstrated as a line officer. The sincerity of this quiet individual was recognized by the brethren in their enthusiastic attendance at programs for Brotherhood Night, Service Committee Night and Clergy Night. By personal example he motivated the membership to support the financial drive of the Maiden Masonic Association to purchase and modernize the Masonic building. Mount Scopus Lodge was well represented in this activity by Right Worshipful Jacob J. Glazin as co-chairman of the Fund Raising committee, Worshipful Bertram E. Green as Treasurer of the Building Committee and Worshipful Edward I. Adelman as Building Manager. In 1965, Worshipful Joseph Grossman's dedication to Freemasonry was acknowledged as he became Master of the Thirty-fifth Lodge of Instruction. The installation of Worshipful Sidney G. Stillman was notable for the presence of three generations of his family to make the occasion more enjoyable, socially and fraternally. The traditional programs of the Lodge were continued with outstanding success as indicated by the attendance at the Table Lodge, Chanukah Party, and Past Masters' Night which again saw the Ruderman family raise a relative to the sublime degree of Master Mason. Another first for Mount Scopus Lodge was Brother Stillman's introduction of an Optometry Night as members of that profession occupied various stations in raising a brother Optometrist in due and ancient form. A citation was presented to the Master for the Lodge's contribution of over one hundred pints of blood to the Grand Lodge program. The Lodge was also honored by the appointments of Right Worshipful Jacob J. Glazin as Honorary Grand Marshal of the Grand Lodge of Israel. The optimistic and cheerful atmosphere which permeated the Lodge apartments at the installation of Worshipful Harold Cohen on September 25, 1963 was an augury of his administration. Our twenty-fifth Master was one of the most dedicated, innovative and hard working leaders in our history. His ability to inspire the brethren to support all the Lodge endeavors was the result of personal commitment and organized planning. One of the highlights of the year was the tremendously successful Homecoming Night, a first in the history of Mount Scopus Lodge, with over four hundred in the banquet hall. This festive evening of fellowship and friendship was climaxed by an inspiring message from the guest speaker the Honorable John A. Volpe, former Governor of Massachusetts. May 27, 1964 was another first as an outpouring of members and guests gathered for a Service Committee and Celebrity Night which became the annual Charity program as all funds received that evening were donated to the Multiple Sclerosis Society. The enthusiasm generated by Worshipful Harold Cohen provided the impetus for the continued success of similar programs for many years. Worshipful Jacob Factor was equal to the task of upholding the standards of the Lodge in both its ritual and social activities. This forceful and energetic Master welcomed the challenge to plan each communication as a special event. The response of the brethren at every meeting attested to the success of his endeavors. At Past Masters' Night, the audience was taken behind the scenes for a look at politics in Massachusetts by the guest speaker, Secretary <>l State Kevin White. After an informative speech at Fraternal Night, Congressman Torbert Macdonald presented the Lodge with an American (lag which had flown over the Capitol. The Charity Night in March attracted a capacity audience for an entertaining evening which benefitted the Jimmy Fund. As a fitting climax to the year, Mount Scopus Lodge again received a Certificate of Merit for its blood donor program. The meaningful activity of the Lodge was continued by our exuberant twenty-seventh Master, Worshipful Keith C. Klane. In November, we were honored with a Fraternal Visit by Right Worshipful Kenneth G. Swindell, Junior Grand Warden of the Grand Lodge, accompanied by Worshipful Joseph Grossman as Acting Grand Pursuivant. Blood Donors' Night was the occasion for further commendation by Grand Lodge. At this time Brother Benjamin Adelberg was congratulated for his contribution of six gallons of blood (a total to be doubled in time). Outstanding meetings were the Table Lodge, Homecoming Night, and Service Committee Night which was dedicated to Worshipful Jacob I. Ziner as the innovator of this worthy addition to the Lodge's activities. The communication on March 23, 1966 featured the presentation of a special plaque to Brother Albert Hodgman of King Cyrus Lodge in acknowledgement of his regular attendance at the meetings and social functions of Mount Scopus Lodge. The installation of Worshipful Howard Steinberg on September 27, 1966 brought to the Oriental Chair an exemplary leader in his devotion to the ideals of Freemasonry. Brotherhood Night provided the opportunity for an inspirational message by our Reverend Brother Roy L. Minich, the first Chaplain of the Lodge. The communication in May was another Temple Tifereth Israel Night which was enthusiastically applauded for the excellent ritual performed by Temple members of Mount Scopus Lodge. During this administration, Brother Edward H. Meyers was recognized for thirty-five years of service, especially in the role of guardian of the East Gate which had evoked the spontaneous applause of the brethren on many occasions. He received a plaque with a special clock inset. The highlight of the year, however, was the annual Charity Night which featured Mrs. Rose Kennedy as the Master's guest. This gracious lady attracted many family friends and admirers to greet a capacity audience for the benefit of the Kennedy Foundation for Exceptional Children. The success of this evening was a fitting climax to an active Masonic year. The September, 1967 communication marked the installation of an outstanding ritualist as Worshipful Leonard P. Davis became the twenty-ninth Master of Mount Scopus Lodge. This popular and dedicated Mason earned further honors for his efforts in behalf of the Fraternity as he was elected Master of the Thirty-fifth Lodge of Instruction in 1974 and appointed District Deputy Grand Master of the Maiden Seventh District the following year. For the past nine years he has been Treasurer of the Lodge. Needless to say, his administration was busy and fruitful. An outstanding evening was the Aleppo Temple Shrine Night as their degree team and Chanters received an ovation at the conclusion of their performance. The Master was duly commended in March as members of the Lodge who were also Odd Fellows assumed the stations to raise a Past Grand of Lebanon Lodge to the sublime degree of Master Mason. The May meeting was dedicated to our blood donors for the successful continuation of that important program. The evening closed on a sorrowful note as the Master conducted a Memorial service for Worshipful Daniel Seigal who was called to the Celestial Lodge above following a prolonged illness. The administration of Worshipful Stanley G. Krigman was exceptional from its inception as Mount Scopus Lodge witnessed its first Public Installation on September 25, 1968. Our thirtieth Master was installed by his father, Right Worshipful James Krigman, to the applause of a capacity audience. This emotional evening was climaxed by the presentation of a suitably inscribed plaque to Worshipful Bertram E. Green in appreciation of twenty-eight years of service as Treasurer as he relinquished that office. Thus began an exciting year notable for the large attendance at all communications which became special occasions due to the Master's efforts and the warm greetings extended to all. The outstanding success of the Charity Night for the benefit of the Multiple Sclerosis fund was an example of the Master's dedication to the ideal of Freemasonry. That evening was also noteworthy for the ceremony conferring further honors on Worshipful Bertram E. Green as he was awarded the Joseph Warren Distinguished Service Medal. The year concluded with a unique event as a Fraternal Visit by Right Worshipful James Krigman, Junior Grand Warden of the Grand Lodge, was the "first time in two hundred years that a brother of our faith visited a Lodge as Acting Grand Master." A further historical event was recorded when a son as presiding Master received his father in the East as Acting Grand Master. The administration of Worshipful Samuel Fishman was another year of special activity as Mount Scopus Lodge observed its Fortieth Anniversary. Outstanding events were the Religious Service at Temple Tifereth Israel in April and the elegant Anniversary Ball in May. The Homecoming-Charity Night was further evidence of the Lodge's participation in the tenets of our Institution. The proceeds of the evening were used to establish a Scholarship Fund which was later named in honor and in memory of our Chaplain and dedicated Brother Abraham J. Oxman. Since 1971, fourteen scholarships have been awarded. In February, 1970, the Lodge was deeply grieved by the passing of Worshipful Jacob I. Ziner, the seventh Master of Mount Scopus Lodge and our Chaplain for many years. The installation of our thirty-second Master on September 23, 1970, was witnessed by a large number of brethren and their ladies who were duly appreciative of the air conditioning in the recently renovated Lodge room. Worshipful Irving S. Brudnick was a most articulate and idealistic individual who embarked on a goal "to reawaken and re-affirm the Masonic principles conceived by our founders." In Lodge notices and programs the Master took the opportunity to enunciate his strong beliefs in the advantages offered to all who observed the precepts of Freemasonry. Lively discussions occurred in the banquet hall as dinner programs featured speakers who were concerned with specific problems in the community. In January, the Master organized a successful blood drive which was held at Temple Tifereth Israel on a Sunday morning. However, the epitome of this administration was the outpouring of brethren and guests at the annual Charity Night which best exemplified the Masters' devotion to Masonic virtues. Hus untiring efforts inspired all committees to cooperate in a most successful evening for the benefit of the Multiple Sclerosis Fund. The installation of Worshipful Gerald S. Hyde was highlighted by a visit of the Most Worshipful Herbert H. Jaynes, Grand Master of Masons in Massachusetts, who enhanced the pleasure of the evening as he presented the Joseph Warren Distinguished Service Medal to Worshipful Edward I. Adelman, our esteemed Secretary for twenty-eight years. By involving the members of the Service Committee in organizing the programs, the Master maintained the interest and attendance of the brethren at the monthly meetings and special activities. On April 30, 1972, a fire in the Masonic Building made it necessary to find temporary quarters for several meetings. The May communication took place at Temple Tifereth Israel for another successful Homecoming Charity Night for the benefit of the United Cerebral Palsy Foundation. In June, the annual election of officers was held in the Everett Masonic apartments. The fifth public installation of the Lodge on September 27, 1972 was held at Temple Tifereth Israel, the spiritual home of our thirty-four Master, Worshipful Arnold P. Harris. Organized planning and hard work generated a year of enthusiastic meetings at the traditional programs for Brotherhood Night, Service Committee Night, Past Masters' Night, and Senior Wardens' Night. The annual Homecoming-Charity Night in May again resulted in a sizable contribution to the Multiple Sclerosis Fund. The most important historical event of this administration, however, was the merger of Mount Scopus Lodge and Canaan Lodge of Everett creating the largest Lodge in this Jurisdiction. At a Special Communication on June 28, 1973, the Lodge was honored by the presence of our Grand Master, Most Worshipful Donald W. Vose, and a suite of Grand Lodge Officers for the purpose of "uniting these Lodges under the Charter and with the precedence of Mount Scopus Lodge." In a prior ceremony, the illustrious Masonic career of Right Worshipful Jacob J. Glazin was further enhanced as the Grand Master presented him with the Joseph Warren Distinguished Service Medal for his many years of dedication to the Craft. The administration of Worshipful Carl A. Blesofsky was a critical year as the members of the merged Lodges joined the general activities of Mount Scopus Lodge. The first meeting was designated as a Welcoming Night and a cordial invitation was extended to our new brethren to be dinner guests of the Lodge in a joyous celebration. Several new members were immediately involved as participants in various committees and two became line officers. The increase in attendance at all functions created an atmosphere of optimism for the desired success of the merger. The Table Lodge program in February 1974 attracted a large group to enjoy the festive evening. The outstanding communication, however, was the Charity Night in April which filled the banquet hall and contributed generously to the financial success of the evening for the benefit of the United Cerebral Palsy Fund. Worshipful Jordan L. Shapiro was the thirty-sixth Master to sit in the East of Mount Scopus Lodge. His eloquence, personality and sense of humor stimulated the members to respond enthusiastically at all communications. A noteworthy event occurred in January 1975 as we welcomed Right Worshipful Leonard P. Davis, the new District Deputy Grand Master of the Maiden Seventh District, on the occasion of his first Fraternal Visit to the Lodge. He was accompanied by Worshipful Gerald J. Hyde as District Deputy Grand Secretary, and Worshipful Howard Steinberg District Deputy Grand Marshal. This was the third time in our history that this suite was composed of Past Masters of Mount Scopus Lodge. The Past Masters' Night in February was observed as the forty-fifth anniversary of Mount Scopus Lodge and featured the presentation of a clock, with Masonic symbols marking the hours, to Worshipful Edward I. Adelman for devoted service to the Lodge. The Shrine Night in April was another memorable evening as the Aleppo degree team and Chanters demonstrated their skills in the third degree to the applause of a crowded Lodge room. The Illustrious Potentate in the East was Right Worshipful Louis J. Roazen, 33°, a frequent visitor and an Honorary Member of Mount Scopus Lodge. The climax of the night, however, was the presentation of the Joseph Warren Distinguished Service Medal to Right Worshipful Aaron R. Davison, Past Master of Canaan Lodge, a Past District Deputy Grand Master of the Maiden Seventh District, 33°, and the Thrice Potent Master of Lafayette Lodge of Perfection, Scottish Rite of the Valley of Boston. The American Cancer Society was the beneficiary of the annual Charity Night. On September 24, 1975, Worshipful Charles H. Cohen became the first Canaan Lodge officer to assume the Oriental Chair in Mount Scopus Lodge. He introduced the custom of personally greeting each brother as all joined in singing Shalom at the closing of the Lodge. In October, Right Worshipful Leonard P. Davis made his first Official Visitation as District Deputy Grand Master and was received with a standing ovation. February 11, 1976, marked a sad day for Mount Scopus Lodge as a Lodge of Sorrow was convened to pay tribute to Right Worshipful Jacob J. Glazin, whose Masonic achievements as duly recorded have reflected glory and pride in Mount Scopus Lodge history since its inception. The March meeting celebrated a Homecoming-Charity Night for the benefit of funds raised to combat Tay-Sachs disease. In April, Brother Mitchell S. Selib was presented a plaque, suitably inscribed, to commemorate his services as Soloist of the Lodge since its beginning. Past Master Worshipful Edward J. Hoffman was recognized and warmly applauded on the occasion of his forty-filth Masonic birthday. During this administration, the lodge was further honored as Worshipful Alexander Schultz became Master of the Thirty-fifth Lodge of Instruction. Worshipful Lawrence S. Golden was installed as the thirty-eighth Master of the Lodge at an inopportune period marked by a general decline in attendance at meetings and a lack of candidates to motivate the line officers thus resulting in poor morale and a lower standard of ritual. Nevertheless, the Master endeavored to maintain the traditional programs and was applauded by the brethren at several notable communications. The November meeting was an emotional evening as Right Worshipful Leonard P. Davis made his final Official Visitation as District Deputy Grand Master of the Maiden Seventh District. He was accompanied by a large and distinguished suite representing local and neighboring Lodges. In January, a Sports Night attracted a good attendance. The March meeting, our fourteenth Annual Charity Night, was for the benefit of the Multiple Sclerosis Fund. In April, the brethren of Mount Vernon Lodge joined Mount Scopus Lodge lor an enjoyable Table Lodge with appropriate ceremony. On September 28, 1977, Worshipful Simmin N. Labell was installed as Master; an event which was repeated a year later. This marked the first time in thirty years that a Master of Mount Scopus Lodge served a two-year term of Office. Valiant efforts to overcome the apathy in the Lodge received a severe setback as our Secretary for thirty-four years, Worshipful Edward I. Adelman, was called to the Celestial Lodge above on December 31, 1977. A grieving lodge was further saddened as Worshipful Carl A. Blesof-sky passed away, after a brief illness, on March 26, 1978. Only two days later Worshipful Leonard K. Millen, Master in our twenty-fifth year, was also called to the Celestial Lodge above. The toll continued as a shocked membership met at Temple Tifereth Israel to convene a Lodge of Sorrow on December 6, 1978 for the founder of Mount Scopus Lodge, Worshipful Bertram E. Green. Within three short years, death had claimed three recipients of the Joseph Warren Distinguished Service Medal. The administration of our thirty-ninth Master was a difficult period as the members failed to respond to pleas to attend and participate in the monthly communication. There was a better attendance at the family and social programs such as the Ladies' Nights and the children's outing which was revived after many years. The annual Charity Nights were also well supported for the benefit of the Heart Fund in 1977 and the United Cerebral Palsy Fund in 1978. In view of the attention given to the annual Charity Nights of Mount Scopus Lodge since 1964, it may be interesting to note that Claudy's definition of Masonic charity is similar to the interpretation of Tzedakah in our own faith: that alms-giving is not regarded as highly as the ethical, moral and social practices of charity which may not be as obvious. Although financial contributions are important, we learn that charity taught in the Lodge is charity of thought and charity of giving of self (acts of loving-kindness) which may truly "extend beyond the grave to the boundless realms of eternity." In this category we place our Blood Donor program which has been a top priority in the Lodge for thirty years. With heartfelt thanks, we hereby acknowledge our debt to the many Brethren who have been regular donors to the Masonic Blood Bank. We enter our fiftieth year under the able administration of Worshipful Marvin H. Harris who was installed by his brother, Worshipful Arnold P. Harris, on September 26, 1979. Our fortieth Master assumed the East with an avowed determination to revitalize the Lodge. His efforts to date have made a positive impact in achieving that goal. Candidates have given the line officers a necessary stimulus in performing ritual according to the standards of former years. The result has been noticeable in better attendance and commendations from the brethren at their pleasure in participating in well organized programs. The February meeting featured the Gyro Compass Club Degree team from the Draper Labs as they raised a brother in due and ancient form to generate the spontaneous applause of the members. The Past Members' Night in March also evoked praise for an outstanding evening. However, the special events in commemoration of our Golden Anniversary are the Religious Service at Temple Tifereth Israel in April, the Anniversary Ball in May and the Grand Lodge Observance at the climax of the year on May 28, 1980. The time and effort expended by the Master has ensured the success of these major programs for the members of Mount Scopus Lodge. "Even history that we ourselves make has a way of slipping past us like a flowing river." Mt. Scopus Lodge of Maiden is the newest of the 310 lodges enrolled in e jurisdiction of Massachusetts. This lodge was instituted Tuesday, April 22, by Right Worshipful Julian Woodman, past master of Fidelity Lodge of Melrose, and District Deputy Grand Master of the Seventh Masonic District, assisted by Worshipful Harold D. Mack, Past Master of Fidelity Lodge, as Marshal, and Worshipful Albers F. Burgess, also a Past Master of Fidelity Lodge, as secretary. The officers under dispensation are Richard Hardwick, past master of Converse Lodge of Malden, Worshipful Master; Worshipful Elliott W. Aldrich, Past Master of the Lodge of Stirling of Malden, Senior Warden; Elbridge G. Davis of Converse Lodge, Junior Warden; S. Albert Kaufman, Secretary; Worshipful Walter E. Milliken, Past Master of Converse Lodge, Treasurer; William R. Gilman, Senior Deacon; Bertram E. Green, Junior Deacon; I. H. Friedman, Senior Steward; E. I. Golden, Junior Steward; Ezra Green, Marshal: M. S. Jacobson, Inside Sentinel; Edward H. Small, Tyler. Right Worshipful Fred L. Putnam extended the welcome of the district at the dinner. There were remarks by Right Worshipful Charles M. Proctor, past District Deputy Grand Master of the Seventh (Melrose) District, welcome of the City of Maiden, by Mayor William A. Hastings, a charter member of the new lodge; by Senior Deacon Gilman, and by the masters of the lodges of the district. The lodge takes its name from Mount Scopus in Palestine, situated a short distance north of Jerusalem. It is the fourth lodge in Malden, and twelfth in the Seventh District. This page was last modified on 16 October 2015, at 07:53.